It’s been a long, long time since Chelsea lost as heavily as they did tonight against Bournemouth. 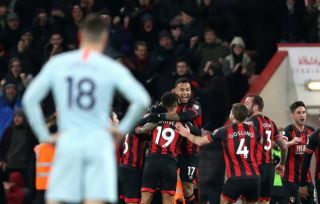 The Blues were thumped by Eddie Howe’s rampant Cherries side this evening, suffering a 4-0 defeat in a nightmarish display that will surely put Maurizio Sarri’s future as manager in major doubt. The last time Chelsea lost by four goals in the Premier League, one of the players currently making a name for himself at Stamford Bridge – Callum Hudson-Odoi – was not even born yet. In fact, he wasn’t even that close to being born. According to Duncan Alexander, that game was Chelsea’s 5-1 defeat against Liverpool in 1996, when Robbie Fowler and John Barnes were among the scorers at Anfield. Before tonight Chelsea hadn't lost a PL game by four or more goals since 1996. Chelsea don’t exactly have the best track record of showing patience to managers, and Sarri really hasn’t had the most convincing start to life in west London. The Italian tactician impressed in his previous job at Napoli, but he’s finding the Premier League much harder and faces a real battle now to improve on the club’s fifth place finish under Antonio Conte last season.